Security testing techniques scour for vulnerabilities or security holes in applications. These vulnerabilities leave applications open to exploitation. Ideally, security testing should be implemented throughout the entire software development life cycle (SDLC) so that vulnerabilities may be addressed in an appropriate manner. Unfortunately, testing is often conducted as an afterthought at the end of the development cycle. Traditionally, security has been handled with a large focus on the network. Security budgets are allocated to defenses that are understood, not defenses that reduce the most risk. Many people understand what a firewall does but the problem is that a firewall will only mitigate threats at the network layer and not at the application layer. With the rise of service-oriented architecture and the fact that more and more data is moving through port 80, the threat of a weak application is huge no matter how many firewalls you put in front of it. The workshop will help in understanding application security related controls in compliance standards like PCI-DSS, ISO 27001, SOX, etc. The entire training is driven by hands-on exercises and case studies to ensure all aspects have a real-life scenario-based approach. This workshop will significantly benefit professionals developing secure applications and evaluating application security. 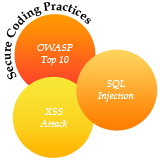 Participants are expected to have some knowledge of software application security testing.